One friend asked if I could sneak him in my handbag and another begged me to pretty please wrap up an entree to go for her. These reactions told me that I was so very lucky to take part in the eight-hour Absolut Sensory Experience seminar and dinner last Friday. What was the big deal about this event whose soul purpose was basically to reopen our eyes to the wonderful world of vodka? It wasn’t so much that cocktail author David Wondrich (Imbibe! and Punch) was there to mix up some cocktails in a pop-up vodka speakeasy or that the guest list was a who’s who in the L.A. cocktail scene from bartenders to bar owners to brand ambassadors to media. Frankly, it was because Grant Achatz (pronounced “A-kitz” as in “packets”), genius chef and 2008 James Beard winner behind Chicago’s Alinea Restaurant, which just received the coveted 3 stars in the new Michelin Guide on Tuesday, was there to whip up nine courses, paired with Absolut cocktails, for us. The point of flying in Achatz and his team from Chicago — not that I would have cared if there wasn’t a point — was to demonstrate how the dining experience is all encompassing, literally a feast for the senses. Achatz is a big believer in getting his diners to employ all their senses when enjoying his food. For example, to evoke summer tomatoes in the middle of winter, he used a plastic pillow filled with the air of freshly cut grass and poked with holes and then put a tomato dish atop it to blow the air out. In our meal, rosemary vapor to complement the lobster dish was created by the server pouring hot water over the rosemary sprigs that surrounded the dish. 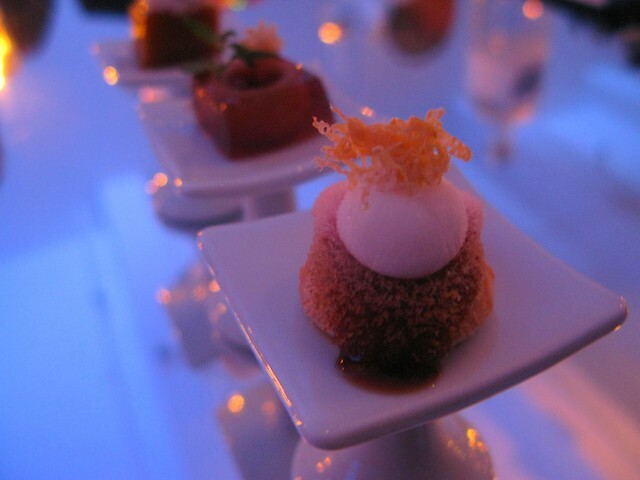 In fact the dinner was the perfect example of thinking outside of the box: cocktails were bite-size amuse bouche on pedestals, utensils were edible, ice was flavorful, and the table was one big plate for dessert. I wish everyone could experience such a meal. But if you’re not going to Chicago any time soon, I wanted to at least share the videos and photos I took to give you a sense of what it was like. Second course: Absolut vodka and pineapple soda with three ice cubes made with distilled coconut, distilled basil and absinthe paired with Steelhead roe. Third course cocktail: Absolut Moscow Mule with Absolut Peppar, lime and lemongrass swizzle stick. I couldn’t swizzle it like everyone else because I was holding a camera. In any case, it still tasted good, refreshing, spicy. Third course: Yuba with shrimp and togarashi (Japanese chili) in an inkwell of miso mayonaise. I could have eaten 10 more of these. Fourth course: Lobster stew with lentils, chestnuts and maitake mushrooms with rosemary vapor. Fourth course cocktail: Absolut Kurant, Absolut Citron, champagne, apple spheres…at least it was supposed to have apple spheres — mine didn’t. Sad face. Fifth course cocktail: Absolut Sazerac with vodka, Pernod and lemon oil. 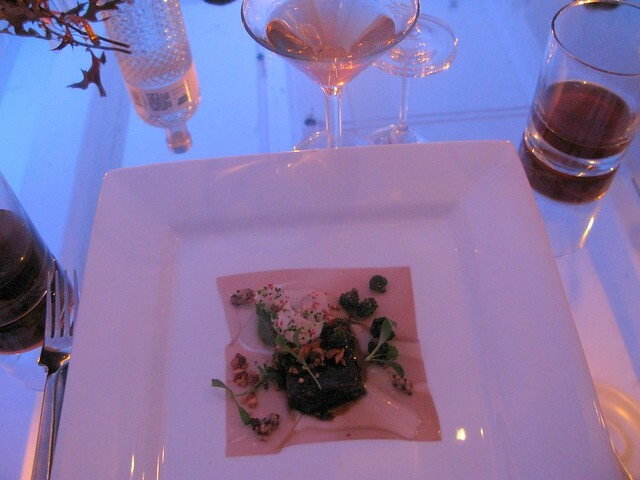 Sixth course: Wagyu short rib paired with Absolut 100 martini. 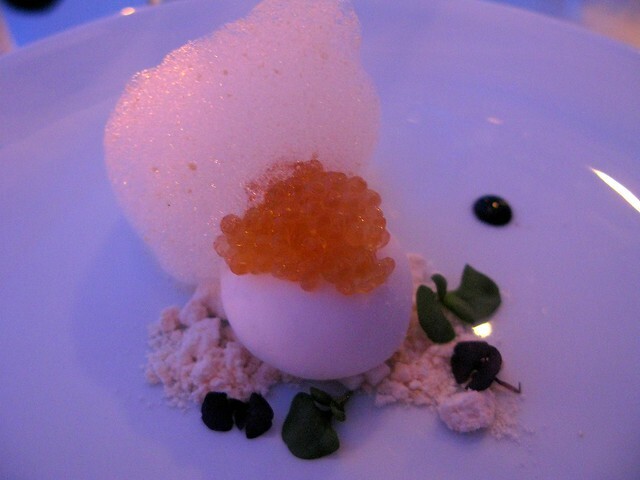 Seventh course: Black truffle explosion — Achatz’s signature dish and the one that got him the job at Trio. Wish there was a whole bowl of these. Eight course: White truffle milkshake. Finale: Achatz plating the tablewide dessert. Great blog, great article. Grant is something special and it is so awesome to see these videos. Keep it up sister, you’re rocking. Grant is a genius and I *had* to include videos of his dinner. Pictures alone don’t do it justice. I. SO. WANTED. TO. GO.